*Camping World Package deals offer you all the essentails for your tent in just one click of a button, you always get a multi buy saving too. The three-zone Palmdale 600 Lux offers active families great flexibility. A D-shaped front door ensures easy tent access and the interior is kept bright and airy thanks to ample windows, plenty if outer vents and large mesh panels located in the internal wall that separates the front wet zone from the middle living area. The sleeping zone for six in a large inner has a zipped internal divider and two doors. 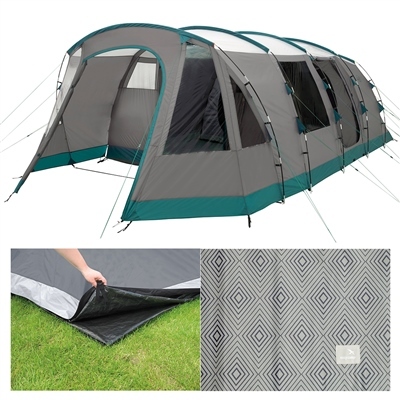 Couples and families with young children, who seek reliable holiday comfort will appreciate the superb value for money, attention to detail and quality offered by the Easy Camp TOUR range of six striking tents.